Lockheed Martin opened its doors today for a Family Day event. When my husband, a Lockheed Martin employee, and I walked through the gates, I instinctively raised my arms up for the security guard to wave a security wand around me. He gave me a puzzled look and then handed me a wristband. “Don’t pass out from all the excitement,” he said dryly. We stepped through the gates and into a brick building. By law I can’t talk about the things I saw inside that place. If you don’t know what Lockheed Martin does, that might scare you— especially because most offices have photos of trees or people fishing. Rest assured, Lockheed is a global company with specialties such as technology, aerospace and most notably, defense. As you can imagine then, there were lots of warning signs and pictures of exploding missiles, but it was OK because I am married to a professional who kept me from wandering into a missile testing room. I couldn’t take any photos and even though the journalist in me wanted to sneak a snapshot, I was too worried a team of security guards would tackle me and drag me away while Derek’s co-workers and their families watched in horror. I didn’t want him to deny he knew me. I didn’t want to embarrass my husband. And that, friends, is being a good wife. 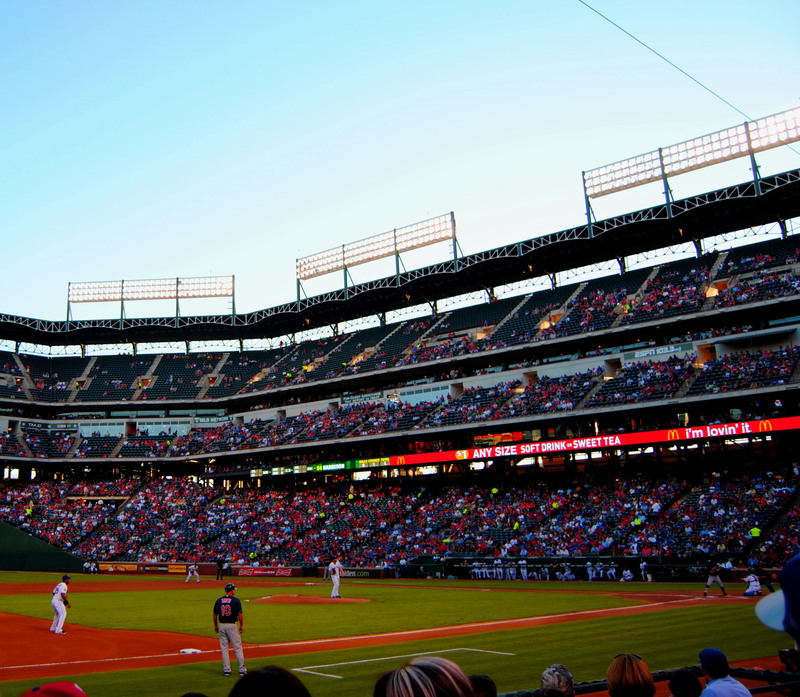 My husband loves baseball, specifically, Texas Rangers baseball. In honor of his second greatest love, I planned a baseball-themed surprise for his 25th birthday. Banners, Coke in an ice bucket, peanuts, and I also dressed up like a baseball player, so when my sweet husband came home, I was outfitted in Rangers colors and a mitt on my hand. I considered holding a bat, but I feared Derek might get a little nervous if he saw his new wife wielding a wooden bat right as he walked through the door. I’ve been to four Rangers games in the nearly three months I’ve been married. If you’re sitting that close, you have to pay attention for stray foul balls. It’s not that I don’t pay attention. Well, maybe it is. But it’s gotten much better. For my first game ever, a World Series game in 2010, Derek bought me food and drinks throughout the game— purchases I think were meant to keep me occupied and quiet while he watched. Since then, I’ve learned players’ names, their walk-up music and Derek has bought me a range of Rangers shirts. I’m not ashamed. I can be swayed with new clothes. Plus, there’s the whole I-promise-to-learn-to-like-Texas-Rangers-baseball- thing I said in my wedding vows. 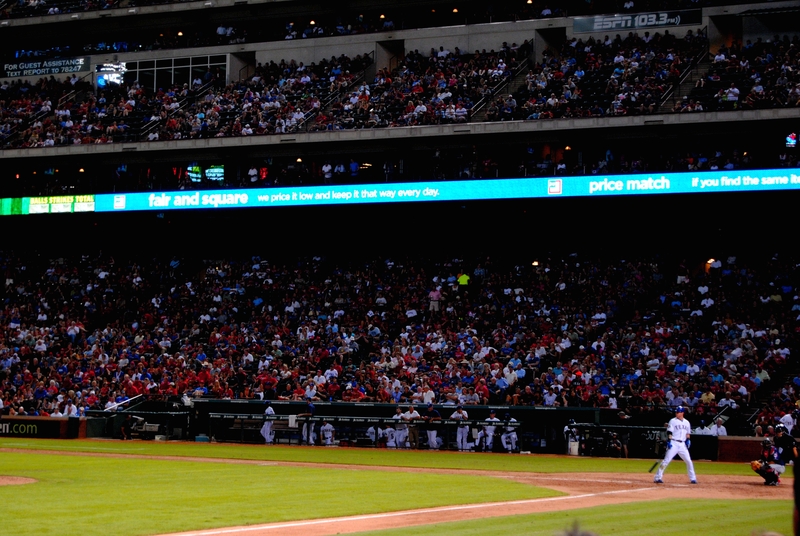 Josh Hamilton takes his stance at the plate.